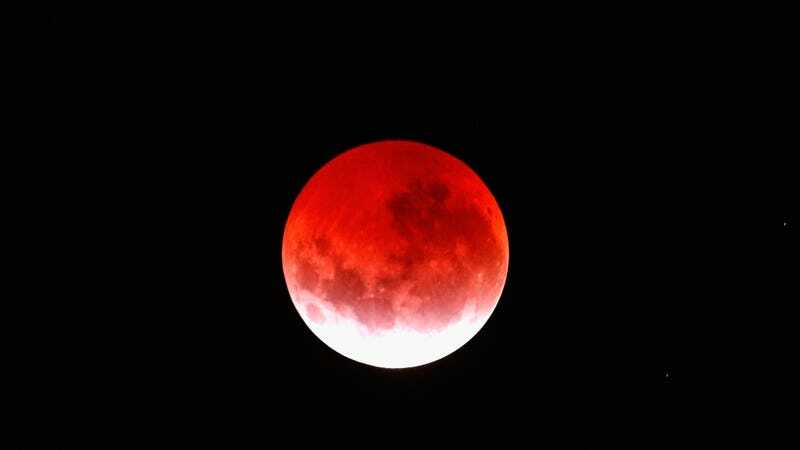 On January 20, celestial sycophants will be rewarded with a special full lunar eclipse called a “super wolf blood moon,” which NASA has hyped as “one of the sky’s most dazzling shows.” But have we ever stopped for a second to think that maybe there are too many moons? Look, I love a good moon as much as the next person. But these days it seems like everywhere you turn there’s another Big Moon that you just need to see, otherwise you’ll be that schmuck who missed out for the next bazillion years. Only last summer we all stood outside for the much-hyped blood moon, which some predicted would bring about the apocalypse. Unfortunately, that didn’t happen, and we, hungry for moons, immediately moved on to asking when the next celebrity moon would grace us with its presence. Now we find out that blood moon was actually nothing compared to the super wolf blood moon. The truth is that no moon will ever truly satisfy us. Not blood moon. Not Cosmo’s moon. Not super moon. Not when moon hits us in the eye like a big pizza pie. Which is why it’s okay if you miss the next big moon. Another one will always come along.